On behalf of EDC and in partnership with the California Sportfishing Protection Alliance, we filed a lawsuit against A-1 Metals & Auto Salvage for violations of the Clean Water Act and for polluting the Salinas River, which eventually flows into the Monterey Bay. 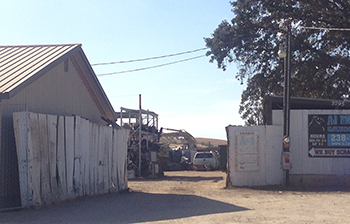 A-1 Metals, located in Paso Robles, has been discharging harmful pollutants, including copper and lead, through storm water runoff in magnitudes that are above lawful limits. These high pollutant levels have been documented during significant rains. This pollution runs into the Salinas River, an environmentally important watershed that is critical to central coast communities’ health and recreation, and is home to numerous endangered species. A-1 Metals runs an approximately five-acre facility that is used to receive, store, handle, dismantle, and recycle decommissioned vehicles, equipment, and auto parts. In addition to illegally discharging polluted storm water, the facility has also failed to develop and implement many state mandated requirements including monitoring and reporting plans, collecting storm water samples, and conducting required monthly visual monitoring. EDC will continue to work to bring A-1 Metals into compliance with state and federal laws and eliminate further pollution, thus protecting the water quality and human and environmental health along the Salinas River.